Please follow me on Bloglovin if you are still interested in doing so. I can't believe it has been four months since I last posted. If you are still with me, thank you. I will try to do better. I won't bore you with all of the details of the last four months. I will just jump in to the here and now. I'm trying to make myself stitch on one big project until it is finished while mixing in seasonal smalls to break the monotony. Currently, I'm working on Mirabilia's Red Lady Pirate as my big project. I can't wait to have her finished and framed. 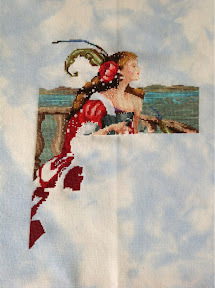 She is a fun stitch and will have lots of beads and bling when she's finished. I have been very inspired by Carol at Stitching Dreams and her Year of the Bowl. Her stitching and finishing is incredible! I am attempting to start my own Year if the Bowl. I have stitched small designs off and on for the past few years, but not many and not with intention. My goal is to stitch and finish 2-3 smalls each month, and by this time next year, I will have a new bowl of stitched smalls to display each month. 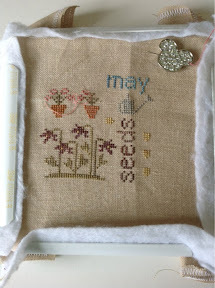 Currently, I am working on May Word Play by With Thy Needle and Thread. I adore this series, and WTN&T designs in general. I plan on stitching this series as one of my 2-3 smalls monthly. I have been looking for an antique dough/trencher bowl to display my monthly smalls but with no luck. When my aunt heard that I was wanting this type of bowl, she offered to let me have hers! Apparently it is something she no longer uses and has stored in a cabinet and she wants me to have it. I am THRILLED! Stay tuned for pictures next month. 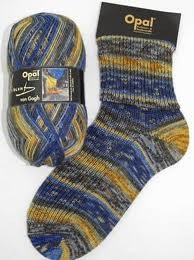 I love self striping sock yarn and plain stockinette socks. This yarn is called Mind The Gap from Etsy seller Trailing Clouds. 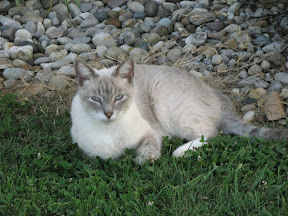 On a sad note, my sweet cat Boo died during the early morning hours of March 28. He had gotten sick the on Tuesday evening . We took him to the vet on Wednesday. He thought he had a bladder type infection. He kept him and performed a procedure to insert a catheter and started antibiotics. Apparently we did not catch this early enough. He was an outdoor cat, and it's sometimes hard to monitor their restroom habits. Boo became septic and passed that evening. We have been heart broken. He was such a sweet boy. Very loving. Very chatty. Very loved and missed. He was nine. I miss him and think about him every single day. I don't want to end on a sad note, so I will tell you that we just returned from a little spring break getaway. We went to Indianapolis to watch the Pacers play OKC. My son is a huge Kevin Durant fan. He was thrilled with the opportunity to get to see him play. We love basketball at our house. This was the first NBA game that any of us had been to but it won't be the last. It was so much fun! 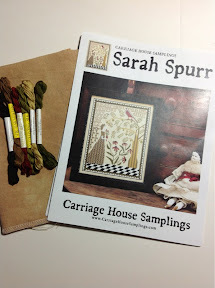 Sarah Spurr by Carriage House Samplings on 40ct Sand Dune by Lakeside Linen with the called for threads. After seeing the this so beautifully stitched on Paulette Stewart's blog, I couldn't order it fast enough. 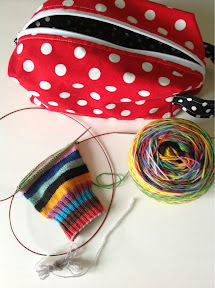 I loved the stories on both her blog and her mother's blog about their annual sampler exchange. You can read those here and here if you haven't already. 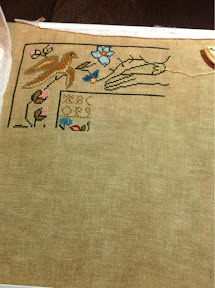 I'm getting ready to put needle and thread to fabric as soon as I hit the publish button. DH is keeping the time clock at the high school football game, DS is playing X-Box 360 online with some of his little school buddies, and I am going to be on the sitting room couch stitching into the wee hours with the TV on. Perhaps I will put in a Downton Abbey DVD. I cannot wait for season 3 which premiers on Sunday! Happy New Year friends/readers/followers. I hope this new year will be happy, healthy, and blessed for all of you. 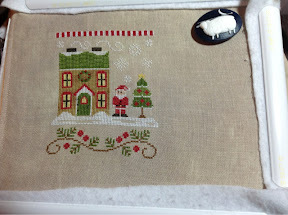 I am participating in Vonna's Santa's Village stitch along. I completed the first block tonight. I'm stitching this on 40 ct. Maple Sugar by Lakeside Linens with the recommended threads with one over two. I'm going to stitch them all on one piece of linen as charted with no buttons. This was a fun stitch! I'm looking forward to stitching them every month. I'm also participating in Nicola's Scarlett Letter Year SAL. I have a few of these charts in my stash and thought this might motivate me to get them stitched and on my walls. I am starting with Elizabeth Sheffield which I started some time ago but had not made much progress. Happy 2013! Hope it's a great one! Just a quick post to share a few random things and a couple of pictures. Here's my progress on Santa after one week of stitching. It doesn't look like much but I haven't had much time to stitch. I'm not one to wish away time, and I'm in no hurry, but I think that one of the benefits of retirement in several years will be more time to stitch. We took a long weekend trip to Pigeon Forge, TN this past weekend. I had the opportunity to visit one of my favorite shops--Dixie Darlin'. It's such a cute stitching shop on a little side street in Pigeon Forge. The owner and the lady that works there are very nice and helpful. They have a cute dog named Macy who roams around the shop as well. I purchased several designs and some fabric cuts--CEC's Summer, Autumn, and Winter. I would like to someday complete all four and switch them out as the seasons change. I also purchased these cute cardinal ornaments/designs and stitched one set of them on the way home. I made these for my parents and plan to stitch another set for myself. They were easy peasy and a fun car project. My Mirabilia obsession continues. I recently finished Mediterranean Mermaid. On Tuesday, I started Santa (also a Mirabilia) design. I love his expression and the ornate cuffs on his jacket. I also love that this one does not use any Kreinik threads. I love the look metallic threads give a design but I don't enjoy stitching with them. We celebrated fall break Disney style once again this year. My parents joined us for this trip and it was wonderful. One of the best trips ever. I wasn't ready to come home. We also celebrated my husband's induction into his alma mater's Athletic Hall of Fame. It was a fun weekend. My husband was humbled and honored and we are so proud of him. 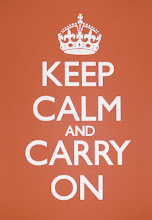 I hope all is well for you in blog land. Sorry it has been so long since my last post. Between work and busy home life, I have chosen to stitch or knit in the spare moments that I have had these last few months. My blog reader is busting at the seams. I'm hoping the pace slows down a bit and I can catch up in all areas. And a belated Happy Halloween from the Pete-ster!